I know that it's still technically March, but summer and warm weather is just around the corner. 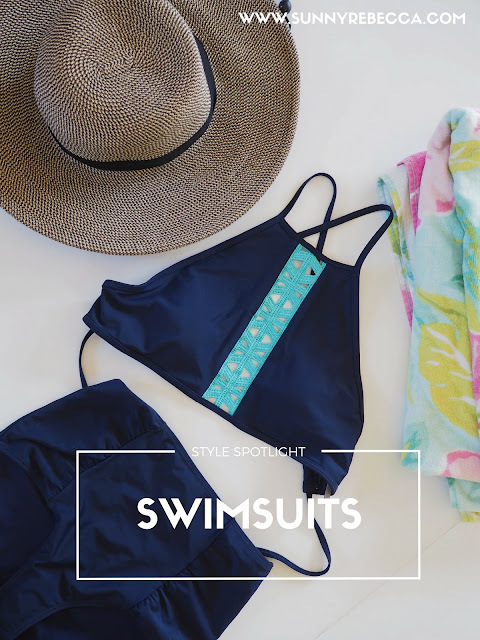 If you're looking to buy a new swimsuit, right now is the best time, as there are the most options around this time of year, which is why I decided to put the style spotlight on swimsuits. I'm focusing on the swimsuits that I have and giving my reviews on them, while also focusing on the importance of a good fitting swimsuit, as with each swimsuit, I'm making new realizations about the things that I like and I don't like in a swimsuit that I didn't quite notice before. Heading to the beach as a leisurely activity came into light around the 1800s. Although it wasn't quite the bikini that we know today, but rather dresses for walking down the shore. It wasn't until the mid-nineteenth century that women began venturing into the water, away from the shore, in their baggy flannel pants and flannel dresses. Soon they began taking over sailor-inspired styles, heading closer to the modern swimsuit that we know today. The graduation from shoreline to swimming was most notably during the 1900s in the 20th century, as women began to stop wearing skirts and long sleeves for real swimsuits that they could actually move freely about in. They showed a lot more of the female figure (scandalous!) As styles became more attractive and flattering, the bikini emerged in 1946. Created by Louis Reard, naming the style after Bikini Atoll, the site of nuclear tests, this scandalous look was debuted in Paris. It received mixed reactions, even becoming banned in some countries. Eventually it caught on. From then to even now, the idea of an "itsy-bitsy-teeny-yellow-polka-dot-bikini" was everywhere and the bathing suits revealed a lot more skin. However, today, we are in a period of body acceptance, offering a lot more variety of swimsuits than the typical bikini or the retro sailor-inspired look. They are changed to be more appealing to a range of body sizes, as well as body shapes. The beauty of modern swimsuit shopping is that there are so many different choices! There are tons of different cuts and styles that can fit your body shape. Another plus is that one-pieces are coming back and are now more than just the simple Speedo, but can be stylish as well. I recommend to not adhere to what's popular, but whatever style fits your body type best and makes you feel most confident in. In the past, triangle bikinis were in and I always felt pressured to get that style. However, looking back on it, that style of swimsuit was not for me. Not only did I feel extremely insecure in them, but it just didn't look very good on me. I've tried out some one-piece swimsuits, but for some reason, I just tend to look better in two-piece suits, but there are definitely a ton of one-piece suits that I'm swooning over. If only I looked good in them! My point is, swimsuit shopping is very personal, and although something may look fantastic on one person or fantastic on the rack, it might not look fantastic on you. It also works vice versa, the things that you look incredible in might not look incredible on someone else. It's all about finding what's the best fit and style for you. Don't forget, while shopping for a swimsuit, it's not just about looking good, but it's also about being conventional. Pick something that you feel nice and secure in (that you can actually swim in!) For example, I tried on a swimsuit a while ago that had no padding, which I could deal with, but it also had zero support, which frightened me a little about actually swimming. Although it was cute, it's also important to be practical. A swimsuit is more than just about the looks and your body, so don't forget what a swimsuit is actually made for. There's just something about swimsuits and I seem to always get the same color one. I have 3 at the moment, I really only wear two of them, but all three of them have almost the exact same shade of blue. Coincidence? Probably not. They're all super cute (at least in my opinion), but I've noticed different things about the fit of all of them upon purchasing them, which goes back to my point about the importance of a good fitting swimsuit. I've mentioned realizations that I've gained from each one regarding fit, so that with each one, I'm learning a little more about the best fit for a suit. I got this first swimsuit about a year or two ago from Aerie. I love the look of underwire bathing suits and they also make me feel a lot more comfortable than with a normal bandeau swimsuit. Although it looks good strapless, I always wear this bathing suit with the attachable straps. I love the bow accent in the center, it dresses up a simple style. I wear this top with a matching bottom, it's a low-rise bottom of the same color. Simple, yet cute. Even though I bought this swimsuit a while ago, they still have the same design, just in a different color if you're interested in purchasing it. This is my most recently purchased swimsuit and I think that it's probably the best fitting to my body type and makes me feel most comfortable in. I actually purchased this swimsuit about a month ago from Aerie and it's already gone! However, here's a similar one, although it doesn't have the same detailing, the cut and general design is the same. This is the bathing suit bottom, which is still available. I love the detailing in the center of the top and I also really like the cut of the top. It has a cross back with the straps at the back, which I think is really cute, but I also love the crop top style. At first, I wasn't sure how I felt about it, but to me, it feels a little uncomfortable to have tops that are too low cut and this halter style gets rid of that insecurity. Also, this is the first time that I've purchased a high-waisted bathing suit bottom and I LOVE it. How could I have never realized how great high-waisted swimsuit bottoms are until now? They're so much more comfortable than low rise ones and since I've been wearing a lot of high-waisted pants lately, it just feels wrong to wear low rise ones. This is the oldest swimsuit that I have and it's from Gap. It has lot of similarities with the first one that I mentioned, the underwire bikini. Like the underwire bikini, this bandeau bikini can be worn strapless, but also has attachable straps (that I love). It also has a bow in the center. In terms of the look, the main difference is the print, this one has seahorses on it. I was initially drawn to this look solely for the seahorses. However, this one is lined a lot more lightly, as it has no underwire. I found that although this bandeau bikini is cute, it tends to scrunch up due to the tie in the center, and that was a little uncomfortable for me. In terms of look, I love the style and I love the pattern. The main drawback that I have with this suit is just comfort. It doesn't feel as secure as the others. Although these are the styles that I personally like and fit better for my body type, these might not necessarily fit yours. 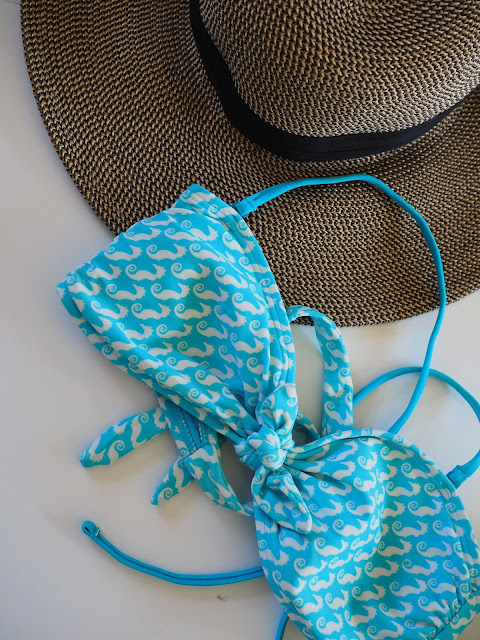 However, if you're looking for a new swimsuit, I've linked some swoon-worthy styles, a mix between different cuts and styles so that hopefully you can find something that you like and fits your body type. Happy hunting!